The following is a table of the present marine reserves as they proceed from proposal to gazettal. Click on their links to read more about them or to make your submission. gazettal July 2003 Is almost a fact. Reserve to be gazetted Is almost a fact. (North Taranaki) Covers a range of diverse coastal reef communities in North Taranaki. Started at 2500ha but cut to 1812 ha in Minister of Conservation’s consent. Concurrence MOF requested Jan 2002 Outcome of Trapski Review  to be implemented. Customary fishing issues to be revisited. The Minister of Fisheries raised issues that were independently reviewed by a retired high court judge. Both Ministers have also instructed the Department of Conservation to have further discussions with iwi (Ati Awa?) to ensure that the Reserve proposal had adequately addresses customary issues. A response is to be prepared and then the Minister of Fisheries will need to complete his deliberations on concurrence. Expected to take several more months. Kaikoura No proposal yet Department to continue discussion with Ngai Tahu re strategy in their rohe. Conservancy requested to prepare proposals to revitalise this application. (Stewart Island) awaiting MOF concurrence MOC approved application 24 July 2002. Concurrence sought. (Otago) Preconsultation to commence late 2003. Early discussion with MFish suggests stakeholder meetings to make progress. DOC planning for new, amended application. (Akaroa Harbour) No proposal yet Department to continue discussion with Ngai Tahu re strategy in their rohe. Taiapure application is expected to require a year to bring to approval stage. Ministers of Fisheries and Conservation to discuss later in taiapure process. (Wellington South Coast) MOF Concurrence sought Application publicly notified on 18 October 2000. MOC approved proposal on 13 May 2002. Ngati Toa lodged judicial review proceedings. Meetings being arranged May 2003. (Kamo High School) Three separate areas within the Whangarei Harbour system Application 15 Mar 2002 Application was formally notified on 15 March 2002. Applicant has prepared answer to objections. DOC consulting further with tangata whenua prior to preparing report for MOC. Submissions closed May 2002. DoC report on the analysis of submissions is to be presented to MOC prior to year end (2003). North-east coast. Proposal for a large reserve (52,772 ha) North East of Great Barrier Island. (DoC) Proposal stage closes 30 June 2003; extended to 31 Jul Resounding rejection of proposal as is but some support for a smaller reserve. Submitted for public discussion March 2003 and closed 31 July 2003. Am external consultant will sort and analyse the submissions. This work is expected to be complete by the end of August 2003. Following this DOC will make a decision whether to abandon or modify the Marine Reserve proposal or process to notify an application under the MRA . (Forest & Bird/West Coast Marine Park Working Group) west coast of Auckland; Plan for area from South Kaipara Head to Port Waikato. Proposition is to establish a marine park with a number of different zones in it including a marine reserve network and a marine mammal sanctuary Proposal stage closes 30 Sep 2003. Public discussion document released 1 April 2003 written submissions close on 30 Sept 2003. Further round of discussion next year before any firm proposal is drafted. (north Auckland) (ARC) Proposal to turn current Marine Park (total fishing ban) into Marine Reserve. Includes proposal to simplify seaward boundaries that increase area by >30% Proposal stage closes 30 Jun 2003; extended to 22 Aug. Status conversion from marine park to reserve. Submissions on proposals by 18 August prior to presentation to DG of DoC for start of statutory process. (DoC) DoC have been conducting seabed habitat surveys in the Firth as part of a wider Waikato coastal marine investigation – East and West Coasts. This is part of an information gathering exercise that has really only just got underway. No proposal yet Bird sanctuary on mudflats near Miranda bird sanctuary. No plans and no public consultation. The investigations may identify habitat that could be considered of interest for some form of protection but no areas have been identified in the Firth. (Bay of Islands Marine Action Group) As yet no specific boundary proposal This is a community group with serious intentions about evaluating options for protection in the Bay of Islands. Iwi consultation is underway and they are promoting discussion with local communities. DoC is servicing the group in responding to specific inquiries but at this stage has no intention to be an applicant. Public consultation has not started. (Local community Group) No specific boundary proposal. Local community group has been going for about a year to look at options for protection in the Greater Doubtless Bay area. Considered to be serious in its intent. Have started consultation with iwi and communities. (On the Forest and Bird website) This is based on concerns and reports about five years ago on special fauna & effects of trawling. No proposal yet. DoC have not picked up any particular group or investigation underway for any specific proposal. (DoC) DoC concerned over the rapid growth in numbers and activity increase charter boats visiting the area No specific proposal Yet to develop areas for any proposals but tech work will be starting and if they decide to consider any areas for marine reserves will start to develop an advocacy message for local people in 2004. DG= Director General of DoC; MOC= Min of Conservation; MOF= Min of Fisheries; MOT= Min of Transport. In 2002 the Ministry of Fisheries provided advice to the Minister of Fisheries that recommended that he should not concur with the granting of a marine reserve for Parininihi (North Taranaki) and Glenduan (North Nelson). The Ministers of Fisheries and Conservation asked the Chief Executive of Fisheries to commission a review of the process used to develop the Ministry of Fisheries reports on these applications and to consider whether, in light of the review, either of the reports should be withdrawn or modified. Retired Judge Trapski was engaged to undertake the review. 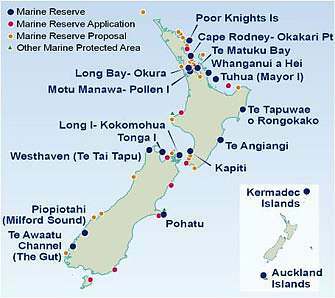 That more marine reserve applications can be expected, is indicated by this map which is part of the Auckland Conservancy Management Strategy 1995-2005. Similar maps must be available from other conservancies like Northland and Waikato.